Winter is finally breaking in the south and allowing for some manageable days out. Today gave me bluebird skies and some wind (but manageable) on Lady Bird Lake in downtown (yep I said downtown) Austin, TX. It started pretty cool this morning, and when I hit the water at 9:30am air temp was 46°F - a welcome change, but still a bit cool. By 10:30am I had two fish in the boat - a 16" and a 15" - on the F4 “Hag's Tornado” in watermelon chartreuse, and felt pretty good. The air temp was up to 60°F at that point. The wind shifted from the east to south, and I hit a dry spell. I paddled from the creek toward the bridges in search of deeper water. Water temp in the creek was 68°F. 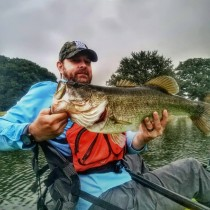 I talked with a buddy who was out fishing for a bit, and the bite was slow for them early as well. In no hurry today, I monkeyed with the Lowrance “Elite-5 I” just trying to get the settings right. After about an hour I was ready to post it up for sale, but finally got it figured out and the readings were much better. I lost a fish under one of the bridges and couldn't find another, so I paddled further down to a rockpile. The water temp here was 64°F and much closer to what I was looking for. I picked up a few of the new Sebile lipless cranks this week, and decided to give one a shot along the rocks. Third cast and paydirt -18" fish! I moved a little further down to a drain, and couldn't get the fish to hit the Sebile. I was marking them, so I went back to the Hag's and managed to catch six more fish on this one spot. Two were dinks, and the rest were all 14"+. The spot exhausted, I explored a little more, chatted with some folks who were on the jogging trail about the Commander, and decided to paddle back to the bridges. It was 4pm, the sun was warm, and people were out everywhere. I threw where I broke off earlier and had a hard take. The line popped again after some fighting, and I was done. I put that rod and reel down, and picked up a heavier setup. I let that spot rest and picked up a few 14”-15" fish around some timber on the Hag's. After thirty minutes I went back and pitched the back side of the twice-burned piling. Jackpot! I finally landed the 18" fish. I worked my way back down the shoreline toward the creek. There were lots of kayaks in there, but no one fishing. I went to my two spots, and picked up two more keepers and a couple of unders. By this point it was almost 6pm and I was getting tired. I paddled across to the launch side and picked up a big jig. Taking a local jig fisherman’s advice, I went black with some red. Ten minutes down the bank I felt a pop-pop-pop on my jig. I reeled down to it and hammered back. This was a fat girl! I was hoping for a twenty-two incher, but she was only 20". The fish was lots of fun to catch, and put on a good show for the joggers. All in all I caught twenty three fish today. A ton of those came after 2pm. The jig fish and Sebile fish were the only ones not caught on the Hag's today. On the Lowrance units, you'll need to setup your 2d and finder settings in single screen mode. The split screen when you can see the GPS will not give you all the options you need. Get out into some 10ft water or so and go to the 2D mode. Adjust you sensitivity up and down until it clears up the distortion. Also, I put both of my noise rejection and surface clarity settings on high. Hope that helps some.